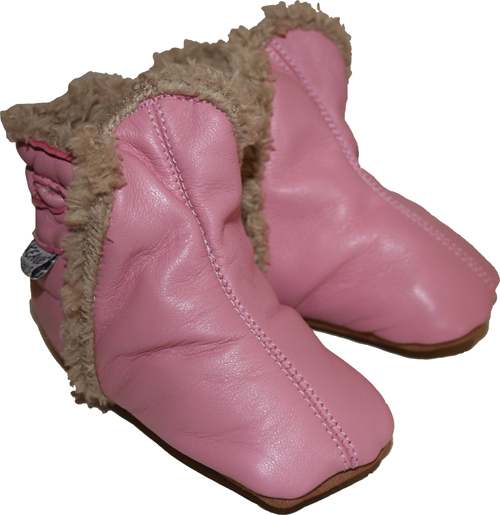 Soft leather Skeanie UGG with teddy bear like faux-fur lining will keep those little feet nice and warm. *Skeanie is a preferred provider of the Australian Podiatry Association. SKEANIE is a Preferred Provider of The Australian Podiatry Association (NSW). At birth, feet are mostly cartilage. It is during childhood that the bones in the feet form; during this time the feet are fragile and any undue pressure is not advised. Soft soles are a must for pre-walkers and early walkers. SKEANIE soft soled shoes are hand-crafted from high-quality genuine leather; they are designed to nuture and protect little feet. The suede sole provides superior grip whilst crawling and walking. My little girl has a pair in pink in 6-12 months. She loves them so much that she throws a fit when I take them off. They are very cute.